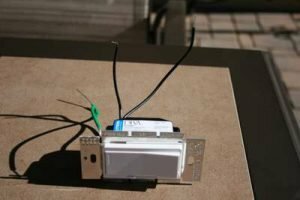 Learn how easy it is to wire a dimmer switch in your home with these step-by-step instructions. Wiring a dimmer switch is a great way to add some ambiance to a room in your home. 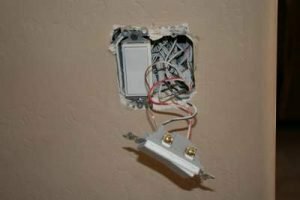 This article is supplemental to the recently posted video about replacing a single-pole switch with a dimmer switch. As with all electrical projects, safety is paramount, and the the most important thing to remember is not to work on live circuits! Turn off the power FIRST! 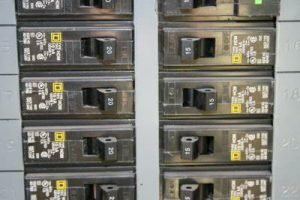 Review our safe work practices page on the website, and any other applicable resource that you may have at your disposal prior to beginning any electrical project. Check with your insurance provider, and with your local electrical or building authority for any required permits or approvals that may be required. If you aren’t comfortable with this, or any household electrical project or task, ALWAYS refer the work to a professional. 1. The lamps are dimmable, such as Incandescent, LED, or dimmable Compact Fluorescent. 2. 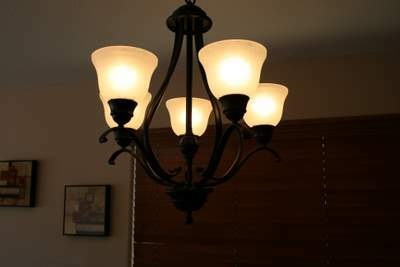 The total wattage of all the fixture lamps do not exceed the rating of the dimmer switch. If not, replace the lamps to meet the above two requirements. In our example project, the lamps are five x 60W (= 300 watts) incandescent, and the dimmer switch is rated at 600W maximum. After turning off the power, remove the faceplate on the switch box that you are working on. Use a meter or tester to ensure that the power is off by checking both terminals of the existing switch in reference to ground or neutral. 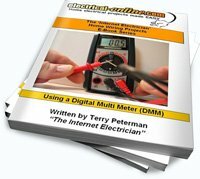 Order your copy of my e-book, meters and testers for a full explanation of how to use these essential tools. Remove the device that you wish to replace. Make sure that it is a single-pole switch (2 terminals and maybe a ground wire as well), and not a 3-way switch (3 terminals). 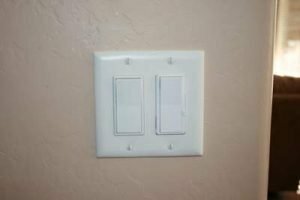 If it is a 3-way switch you will have to replace it with a 3-way dimmer switch. I will create a future article covering that scenario. Remove the 2 wires from the existing switch by cutting them with diagonal pliers or other suitable device, or loosen the screw terminals as required. In our example, the new dimmer switch has pig-tails to connect to the existing wire. Remove the ground wire from the old device (if applicable). 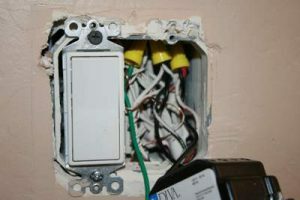 Strip the appropriate amount of insulation from the existing conductors to splice to the dimmer switch. If your old switch didn’t have a ground wire connection, you will need to add in a pig-tail to an existing ground wire splice. Anytime a device has provisions for connecting it to a ground wire, you must ground the device. Starting with the ground wire, connect the wires from the new dimmer switch to the existing wires. With 2 black wires and a ground on the new dimmer switch, it doesn’t matter what black wire gets connected to the 2 wires that were connected to the old switch. In this example, we had a black wire and a red wire plus a ground connected to the old switch. Make sure you only have about a 1/2″ of insulation stripped so that no bare wire extends below what will be covered by the wire connector. Hold the wire so that the ends line up evenly and then gently start spinning on the wire connector in a clockwise direction until you can feel that it is grabbing on to both wires. Tighten it snugly and then tug test to ensure that both wires are firmly connected in the splice. If one pulls out, snip off the ends of the wire, re-strip if necessary, and start the spice again. Tuck the new splices and wire connectors in to the back of the box and out of the way to make room for the new device. 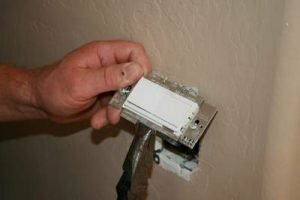 A dimmer switch will have a larger body than the single-pole switch you are replacing, so make sure you have room for it. Test fit the dimmer switch into position before installing the device screws, and don’t force the switch into place. If the device won’t fit beside the other switch in a multi-gang installation, such as this example, you must break off the tabs on the new device on the side adjoining the other switch. Install the device mounting screws, tightening just firm enough to that it doesn’t slide freely from side to side in the oval mounting holes, but so you can move it if you need to adjust so that the faceplate fits. Test fit the faceplate and adjust devices if necessary. Then mount the faceplate with the faceplate screws. Line up the screws when tight. Turn on the breaker and test your installation. Good job! For a better visual and description of this project, click here to view the video! It is said that most North American homes have more television sets than dimmer switches. Dimming of lights can be very useful to set a softer mood for the room, and to allow you to provide the appropriate adjustable level of light. They are also an energy saving device that will pay for themselves in utility bill savings if used effectively. 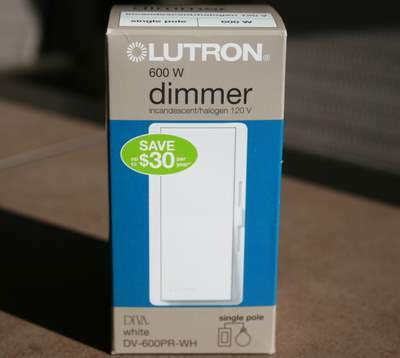 This entry was posted in Home Electrical How-To, Switches and tagged dimmer switch, how to replace a switch with a dimmer switch, light switch, Lutron Diva 600W slide dimmer Switch, replace a switch, single-pole light switch, wire a dimmer switch in your home, wiring a dimmer switch, wiring a single-pole dimmer switch, wiring a switch. Bookmark the permalink.